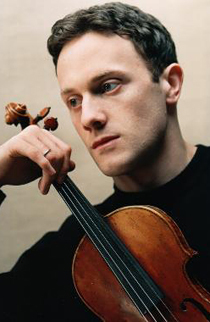 Matthew Trusler, violon, was born in 1976. Matthew Trusler graduated from Philadelphia’s Curtis Institute of Music in 1998. Matthew Trusler has been invited to perform as a recitalist and concerto soloist throughout Europe, Australia, the USA, Japan and South Africa. In the UK he has performed with most of the major orchestras, including the BBC Symphony, BBC Scottish and BBC Welsh orchestras, the Philharmonia, London Philharmonic, Royal Philharmonic, City of Birmingham, Halle and Academy of St. Martin-in-the-Fields, and has appeared further afield with the Minnesota Orchestra, NDR Hanover, Helsinki Philharmonic, Deutsche Symphony Berlin, Malaysian Philharmonic and Johannesburg Philharmonic. Some of his personal highlights include tours with the Australian orchestras (including appearances in Perth, Queensland and Tasmania), a tour of Germany with the Academy of St. Martin-in-the-Fields and Sir Neville Marriner, and a tour of Mexico with Martyn Brabbins and the Philharmonia. Alongside his concerto work Matthew Trusler is an accomplished recitalist and an avid chamber musician. Trusler has performed frequently with Wayne Marshall, and the duo’s recent disc Blues presents a collection of short pieces by composers directly influenced by jazz. The CD was released to huge critical acclaim, including CD of the week in the Telegraph, CD of the week on Classic FM, and Recital CD of the month in Strad Magazine. Collaborations with other eminent musicians have included Piotr Anderszewski, Martin Roscoe, Peter Donohoe, Imogen Cooper, Leonidas Kavakos, Lynn Harrell, and Joseph Silverstein. Trusler has performed recitals in leading venues around the world including the Wigmore Hall in London, the Auditorium du Louvre in Paris, and the Palais des Beaux Arts in Brussels. Trusler founded Orchid Classics in 2005, and the label is now distributed internationally by Naxos. Past and future artists to appear on Orchid include James Gilchrist, Guy Johnston, the Brodsky Quartet, and Ex Cathedra. Trusler also has a passion for film, and has recently acted as a consultant on the adaptation of Norman Lebrecht’s novel The Song of Names for film, the screenplay being written by Jeffrey Caine (Oscar Nominee for The Constant Gardener). Earlier this year, Trusler recorded the violin solos for the soundtrack of a new French film by director Frédéric Mermoud, Complices. Matthew Trusler holds a teaching post at the Malmö Academy in Sweden. He plays a 1711 Stradivarius.